'Run for your wife' is the longest running play in the world (so they say). In India, it has been adapted by 'Behroopiya Entertainers' (under license by Samuel French Ltd. (JAGRITI)). The original is written by Ray Cooney and it premiered way back in 1983 in London. The Indian presentation has been directed by Mrinal Dhar. It is the story of Delhi cab driver Parminder Singh Bedi, who has two wives, two lives and a very precise schedule for juggling between them both. With one wife at home in Tilak Nagar and another at home in Rajouri Garden. Too add to the confusion is the upstairs neighbour in who gets entangled in the web of lies but tries his best to help. It was after a long time I laughed my heart out. With quality of Indian humor falling faster than morals of Indian politicians, this play brings some hope. This is not one of those mindless comedies which use slap stick humor and cliches which makes you question your own intelligence for having spent your time and money on it. For this comedy, do keep your brains switched on because it gets really confusing and this is a situational comedy at its very best. It begins with an 'unscheduled' encounter of Mr Bedi with an old lady's handbag with him being taken to the right home at the wrong time and thus begins a series of lies and confusion. I am sick of those comedies where all the characters are dumb as a rock and directors try to make audiences laugh through their dumbness. 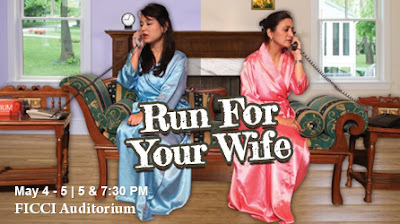 This play presents that how people with normal intelligence end up in cobwebs of lies and deceit. No one is dumb in this play. The primarily English play has dollops of Punjabi thrown in which gives the play that perfect local flavor. While most of the actors were perfect in their own characters but were limited by the range of the characters they were playing, it was the character of Sukhi Singh Bali which provided the best of laughs in the entire play. He is the first one to know about the taxi driver's double life and therefore his only confidant. Sahil Kapoor, the actor playing Sukhi, provided amazing facial expressions ranging from delight to pain and to fear along with expressive body language. The audience was in splits throughout the play time of 90 mins and there were no dull moments. It is a one act play and the single stage set sometimes represents two homes and sometimes just one. It is the first time I have seen such a use of one single frame. Kudos to the creator and the director of the play for that. Do catch this play the next time it is in your city. You will relieve your entire week's stress. I am awaiting the next production from this group. Very well said - the play was very well adapted to local scenario and the artists have done a greaaaaaaaaaaaaat job. Thank you Guys. I will be putting up more reviews on plays as I watch them. Feel free to contribute if you want.